The problem? I do not see an about me or anything with the word merge in it anywhere. Note to Stack Overflow staff: when you give some one directions it is not very effective to start in the middle of a process and hope they find where ever it is that you started. It is wise to give direction starting at the beginning. Anyone know what they are talking about or where this mysterious merge is hidden? Let me click on Stack Exchange, NOPE! How about help? There's an About us, NOPE! Maybe my picture, hey here's more stuff, maybe my profile, NOPE! for the heck of it I can try activity, NOPE! Are the Stack Overflow instructions useless? YES! Not the answer you're looking for? Browse other questions tagged support merge-accounts . 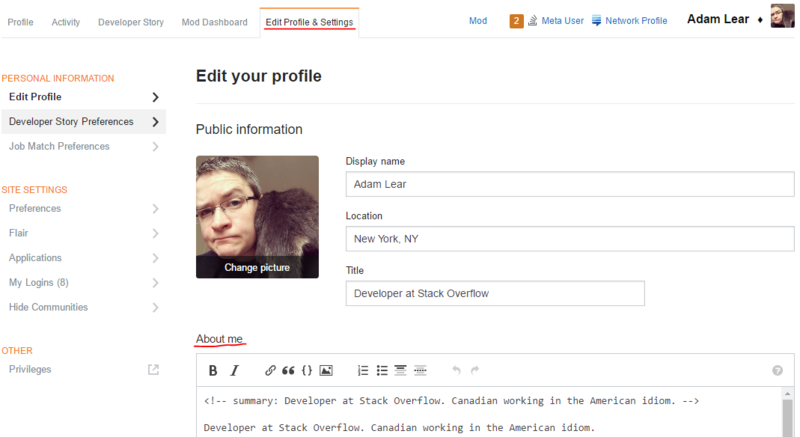 How to merge user profiles? Why didn't I receive two emails to merge my accounts? Can two accounts be unmerged?